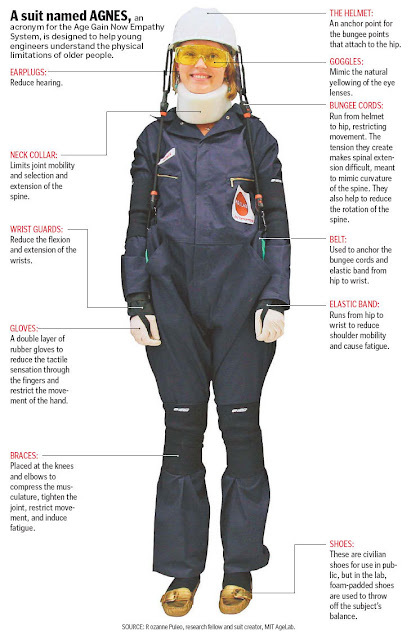 MIT's AgeLab has come up with AGNES, the ageing suit. It enables anyone wearing the suit to experience what it feels like to be in a 74-year old body. Reaching for items on the top or bottom shelves can be near impossible for ageing limbs. Your arms can't stretch that high, and your knees simply can't bend that low. Your failing vision means you can't read the food labels and your arthritic fingers don't allow you to have a firm grip. All of which means that everyday chores like shopping for groceries at a supermarket can be quite a challenge for the elderly. The idea behind the age suit is to simulate the restrictions and limitations an ageing body has on movements and mobility that most people take for granted. The purpose, according to Joseph Coughlin, one of the suit's creators and the founder and director of MIT's AgeLab, is to enable companies and governments to understand what needs to be done to make a product or service more user-friendly for an ageing population. The number of people 65 and older is expected to more than double worldwide, to about 1.5 billion by 2050 from 523 million last year, according to estimates from the United Nations. With statistics like these, the business of ageing looks set for exponential growth.